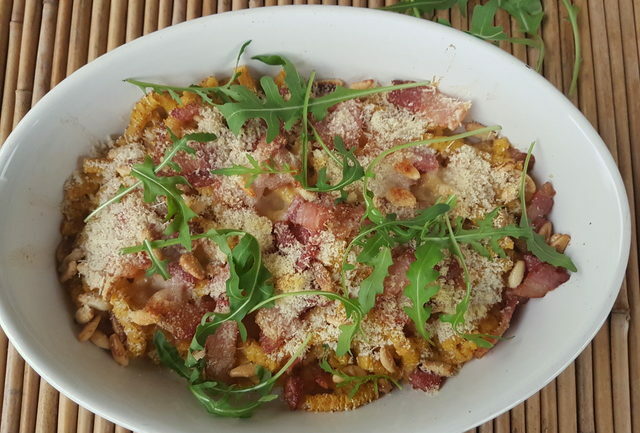 Baked Passatelli with Pancetta & Pine nuts. 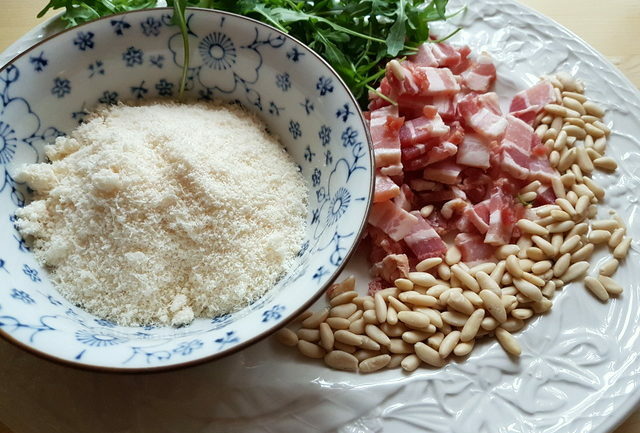 Passatelli con pancetta, pinoli e rucola. Passatelli are fresh pasta made with breadcrumbs, grana or Parmesan cheese, eggs and lemon or nutmeg. Traditionally, they were invented as a way to make soup more filling and to use stale bread leftovers. 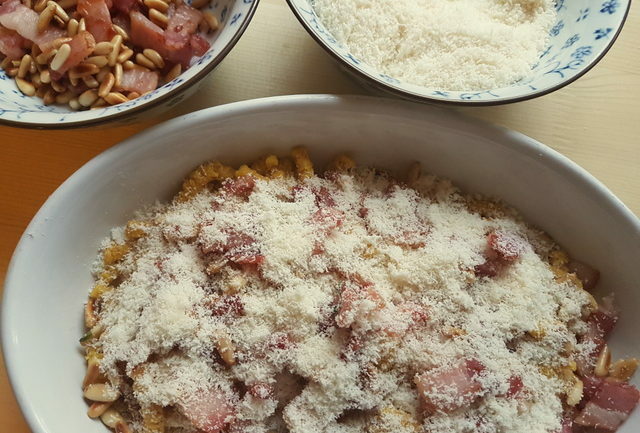 Nowadays they are a type of pasta the people of Emilia-Romagna are proud to claim as their own. 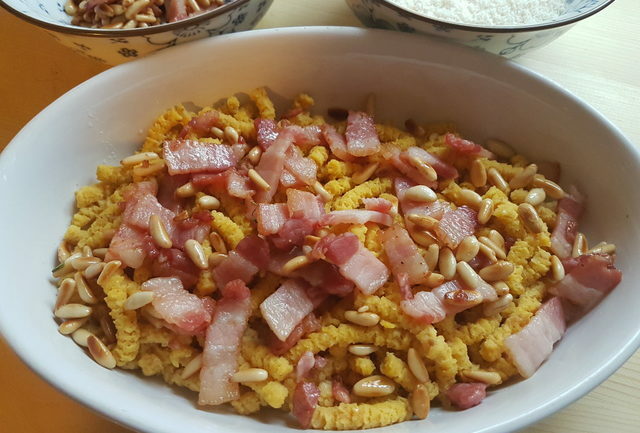 Passatelli are normally served in broth or soup but there are many Italian recipes to prepare them ‘asciutti’, meaning served dry. 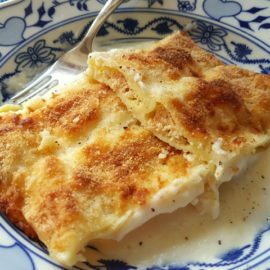 They can be served with seafood, meat or vegetables and are a delicious alternative to normal pasta. 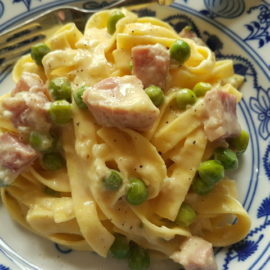 The first time I made this unusual pasta, I was feeling a bit lazy and didn’t feel like making a chicken or beef broth beforehand. 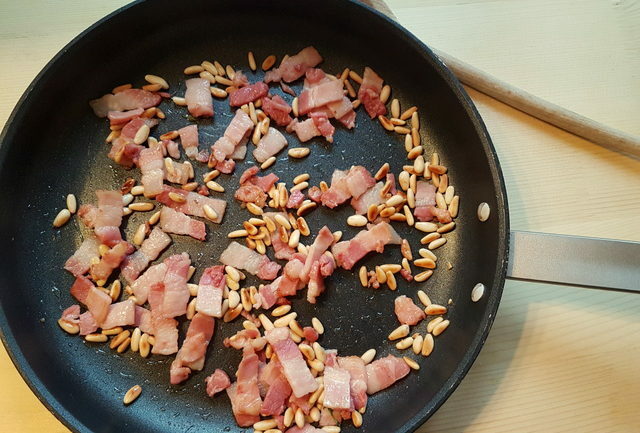 I searched a number of Italian language recipe sites and actually found a plethora of alternative recipes, including this one for baked passatelli with pancetta and pine nuts. Actually ‘baked’ is a bit of a misnomer as they don’t need to be baked for long and you can also just put the dish under the grill. The preparation and cooking of this dish do not take very long. However, the pasta dough needs to be left to ‘rest’ for at least 2 hours before cooking and the dish has to be served immediately. The best option is to plan to do it in 2 stages, leaving the final stage for close to the time you plan to serve the meal. 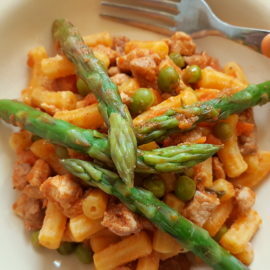 Unlike other pasta, passatelli can’t be cooked beforehand and are usually cooked in a stock or broth. For the recipe to make the passatelli themselves, follow the steps in the recipe card on my post about passatelli. 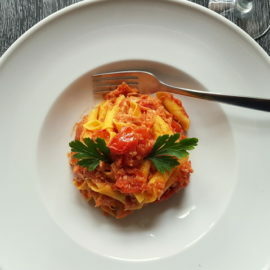 Once the pasta is cooked, remove it from the stock and follow the steps in this recipe for an unusual and delicious pasta dish. 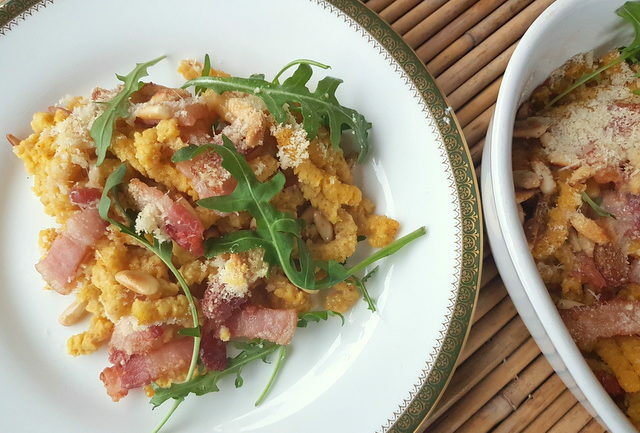 If you make this baked passatelli recipe, I would love to hear how it turns out. Please feel free to write a comment here or send me an email. You can also comment on the Pasta Project Facebook page. I’d love to hear from you!